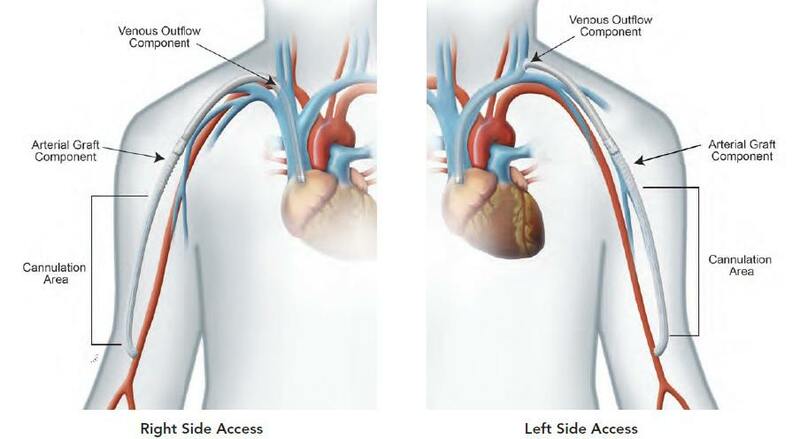 The placement is similar to both tunneled cuff catheter placement and graft placement. It may require angioplasty of the central veins prior to placement of the Venous Outflow Component. The HeRO Graft implant can be done under general anesthesia or conscious sedation. The average procedure time is 60-90 minutes. Complete implant instructions are provided in the Instructions for Use manual. Use of the HeRO Graft was clinically studied in the upper extremity utilizing the internal jugular vein. Central venous access through any other veins has NOT been studied and may increase the risk of adverse events not encountered in the clinical trial. Surgeons must use discretion in selecting appropriately sized target vessels to accommodate the 6.3mm outer diameter of the Venous Outflow Component based on each patient’s anatomy. Watch Dr. Marc Glickman implant the HeRO Graft in a patient with central venous stenosis. How to implant the HeRO Graft to traverse central venous stenosis in qualified patients. Utilizing percutaneous endovascular techniques, the Venous Outflow Component is placed in the central vein with the radiopaque distal tip in the mid to upper right atrium. At the deltopectoral groove, the Connector on the Arterial Graft Component is joined with the Venous Outflow Component. A standard arterial anastomosis is performed to attach the Arterial Graft Component to the target inflow artery.